One of my favorite combinations is chocolate and marshmallow. 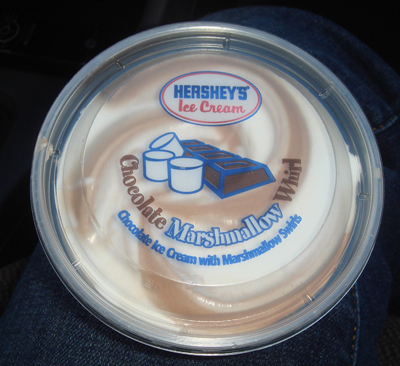 If you ever see Hershey Ice Cream’s Chocolate Marshmallow Whirl, you might want to do yourself a favor and get one because they’re fantastic. I still don’t understand how Hershey Ice Cream and Hershey Candy exist without some sort of lawsuit but it must be agreed between them that they can both sell sugar and milk in different capacities. Anyway, chocolate + marshmallow always = awesome to me so when I saw these two next to each other at the store, I had to bring them home and compare. When I tried to get a cross section of this, it pretty much shattered, it doesn’t really mean anything but I just wanted to explain the poor presentation. The chocolate was okay, nothing great but the marshmallow has some sort of weird “non taste” to it. Maybe it was a lack of vanilla flavor but it just tastes like gooey sugar not really marshmallow. A little more stable when cutting in half, we found the chocolate to be a little better but the marshmallow was still lacking something. I know technically on the wrapper is reads “whipped creme center”, but it really had the consistency of marshmallow and I know some products say “marshmallow creme”, so between that and the fact they’re called “mallow cup” I’ll think marshmallow is what they’re going for. Also, it doesn’t state it on the front of the wrapper but there are also small amounts of coconut flakes in the chocolate. The flavor of the coconut does come through and take over somewhat but considering the marshmallow is so mild, I guess SOME flavor has to be dominant. I was surprised that I didn’t find myself loving either of these. I felt like I get more satisfaction in the one little section of Sky Bar than I did with a whole cup of either of these. It definitely had to do with the marshmallow more than the chocolate. 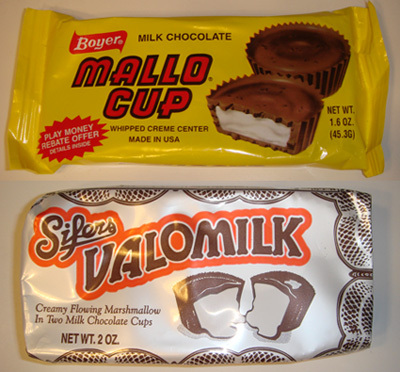 Ethan’s evaluation was that was Valomilk was “gross” and Mallocup was “just okay”. I was walking through one of my favorite sources for second rate snacks, Dollar Tree, and lots of Easter candy and two versions of chocolate rabbits. 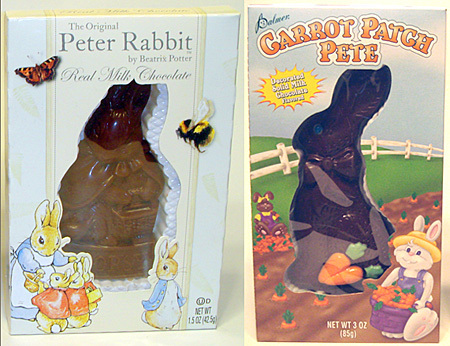 First “The Original Peter Rabbit” and then Palmer’s “Carrot Patch Pete”. What? you never heard the tale of Carrot Patch Pete? I think what intrigued me most is the statement on the package that reads “Decorated Solid Milk Chocolate Flavored” I never get that, if they can flavor it like chocolate, why not just use chocolate? and if it’s not chocolate- what is it? Ok, so I wasn’t paying enough attention and realised when I got home that I had picked up a “Flopsy” instead of a Peter rabbit but we will trust that the only difference is the mold the chocolate is set in and Flopsy tastes the same as Peter. 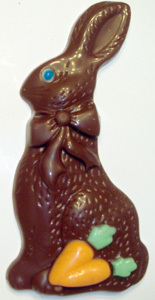 The package reads “Real Milk Chocolate”, written all fancy-like in cursive so we had high hopes for Flopsy. I don’t know how, but this seemed taste like what I imagined Carrot Patch Pete would taste like, and it’s not just because milk chocolate isn’t my favorite. Ethan, who preffers milk over dark chocolate, said this didn’t taste choclately and was “pretty gross”. It sounds weird but it was really hard to describe this, all I can think of is tasteless and disappointing. The first thing we noticed was that Palmer colored in some if the details on Pete. I felt bad breaking him in half because the expression on his face is like he’s thinking “Hey, what are you doing?” but we had to do what we had to do. Pete was very sweet, almost too sweet . I agreed with Ethan that while this did have chocolate flavor, it was very artificial tasting. I looked at the ingredients and saw the first two were sugar and partially hydrogenated palm/palm kernel oil- and that’s what it tastes like. Needless to say we chose not to torture ourselves too much and stopped after one bite. Both losers. I’m still puzzled why the real milk chocolate tasted so bad but we found it to be just as gross as the mockolate. I feel bad for any kids getting either one of these in their baskets to day. Anyway, Happy Easter! 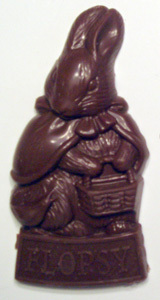 Peter Rabbit or Carrot Patch Pete? Both are gross, no thank you. 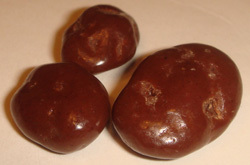 Chocolate and peanut butter, great in any form and in this season it can be found sold in an egg shape. Of course Reese’s uses their top selling product and easily transforms it for Easter. Following their lead, Palmer has created their own version. Palmer seems to be “inspired” by almost everyone, like the Weird Al Yankovic of the candy industry. We were a little surprised that the egg shape of these were rather poorly formed, it was more like an uneven blob. When we tasted this, I found the PB to me moist and flavorful, the chocolate was a little overpowered by the PB but in general I felt this was just as satisfying as the cups. Ethan felt the PB was kind of airy and didn’t think it was as dense as a regular PB cup. This had a more solid egg form, like it was filled in a mold and the chocolate was harder so it had a better presentation. This smelled like a Little Debbie Nutty Bar but had a slightly burnt taste. I’m not sure if it came from the PB or the chocolate but it may have been the chocolate because Ethan doesn’t like coffee and he said the chocolate had a coffee tasting undertone. In the end the Reese’s was more satisfying. I liked the rich peanut butter and softer chocolate coating. The Palmer egg is better for looks though and maybe a bigger hit with kids because there it also has a “silly” face imprinted on the top of the shell. Some may like the coffee/burnt taste. I didn’t think it was terrible but if I had a choice I’d stick with Reese’s. 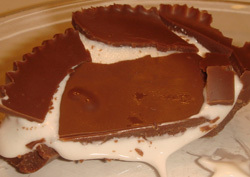 PB Egg: Reese's or Palmer? It’s that time of year again where I think some of the worst in Jewish cuisine surfaces. Don’t get me wrong, I have fond memories of sitting at the kid’s table with a bowl of Aunt Maureen’s matzo ball soup and my cousins and I trying to polish off the Concord Grape wine during the seemingly endless Seder, but some of the most bland, flavorless and confusing food/products come out for this holiday too. Tasteless packaged macaroons, mixes that produce space-station quality muffins and brownies, soup nuts, and these things- raspberry jell squares. I actually like the jell rings but could only find one brand so I got these jell squares. Helping with this evaluation was my brother-in-law Rick, Ethan, and my mom. My little sister refused to partake. The chocolate shell seemed to barely hang on to the jell square, which turned out to be a good thing because it gives you the option of eating just the chocolate. We all found the jell to be pretty sick. While there was a raspberry flavor, the texture was as Rick said “f’d up”. Unlike what you think jell should do when you bite into it, it crumbled when chewed and it was like eating something you weren’t supposed to, like maybe it was toy food from a playset. These had a thinner chocolate coating and barely more edible jell but it pretty much got the same reviews from everyone. I can’t understand what goes wrong with the jell, I really dont’ remember the jell in the ring form of these being so plasticy in texture. The flavor again is just okay but not worth the calories. 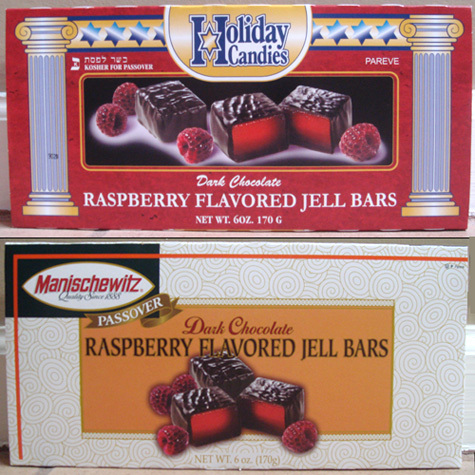 Raspberry Jell Bars: Holiday Candies or Manischewitz? Some more Easter candy comparisons found. Nestle Crunch makes what they call “Nest Eggs” which are mini egg shaped versions of their crisp chocolate. A company called “Frankford” makes a similar version of this treat called Crispy Eggs which I found at my local dollar store. 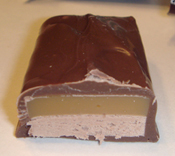 There are plenty of crisp grains of rice in the egg formed chocolate. I thought the chocolate had a nice cocoay flavor. Ethan wasn’t crazy about it because he’s not a Nestle fan and feels the chocolate is lacking in flavor and seems “thin” in taste and substance. Crispy Eggs had noticeably less crispies in it. Ethan liked the chocolate better, he felt it had more “depth” and wasn’t lacking whatever he thought Nestle was. I put my knowledge of partially hydrogenated oil as the second ingredient in these, aside and tried to concentrate on the chocolate flavor. I thought the flavor was similar to Nestle. Split. I liked Nestle’s a little better because it had more crispies but Ethan liked the chocolate in Crispy Eggs better even though he thought they were shaped more like footballs than eggs. He also liked that Crispy Eggs didn’t have any writing on the wrappers, so for display reasons, you may want to pick Frankford. Nest Eggs or Crispy Eggs? Rasinets are a once-in-a-while thing that although I like, I just find myself not buying that much. I think I used to mostly get these when I went to the movies. I probably only go to the movies once a year and can’t even remember the last time I went (Rocky Balboa, I think) so it’s a been a while but after seeing the Haviland/Necco version figured it was time to revisit Rasinets. These have more texture on them than the graphic depicts on the box but I like the little divits that are formed from the chocolate encompassing the raisins. When biting into these, I noticed they’re a little gummy. Slight raisin flavor but it could be chocolate covered spitballs and I might not notice right away. The chocolate isn’t the worst but does have that “mockolate” lack of flavor and just corn syrupy sweetness. Ethan and I also detected some sort of chemical-like after taste. It’s weird I remember liking these but maybe they changed their formula . Haviland wins for taste. I say that because taste is obviously important but it could be because they have partially hydrodentated palm kernel oil and Rasinets doesn’t. I think it’s safe to say neither of these are really healthy regardless of the “fruit” inside but if you care about PH oils you may want to stick with the Raisinets but suffer with the mockolate covered spitball taste. 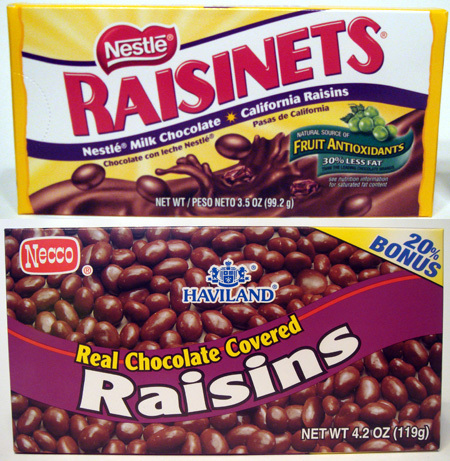 Raisinets or Haviland Chocolate Covered Raisins? I feel like Cadbury really has the market cornered on chocolate eggs they seemed creme eggs recently and today I found a Hershey version of the Cadbury candy coated, or “crisp sugar shell” milk chocolate eggs. On the back of the Cadbury bag it actually states that they’re made by Hershey’s (which in case anyone is wondering is the only version of Cadbury handily available) but we wanted to see if there was a difference in product. These have a smooth, thick candy shell that Ethan described as “airy”. He also though the chocolate was kind of like a cross between milk and dark chocolate, but more like milk. I also thought it had a little dark flavor to it, not much but since I’m not usually a milk chocolate fan, there was something appealing about this. These eggs have a thin, rougher textured shell that feels a little sharper when bitten into. Ethan and I were consistent with our previous feelings about Cadbury chocolate. Ethan really likes the creaminess and says this chocolate has “charisma”. I feel the intense creaminess makes the chocolate thick and then makes me really thirsty. I do like that these are a little smaller than the Hershey’s eggs. Kind of a split decision. Ethan very much liked the Cadbury eggs, I liked the chocolate in the Hershey’s eggs but really am not a fan of this format but if the Cadbury shell could be filled with the chocolate from the Hershey’s egg then I’d pick that. 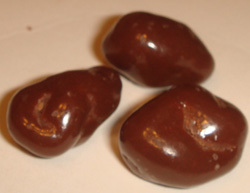 Candy Coated Eggs: Hershey's or Cadbury? 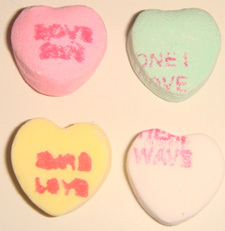 Almost all of the hearts were deformed in some way, either in shape or text. It was like there was zero quality control on the line, at least the shift that produced this box. Eating these was just as impressive as looking at them, they’re hard and chalky like I remembered. Ethan and I did note that each color had a flavor and the saving grace was that the flavor for the most part was pretty strong, although keeping the chaulky undertone. Purple was grape, Orange was orange, Pink was cherry (maybe), Yellow was banana, Green was lime and White was mint. We noticed Brach’s were thicker and the text was stamped on. There were much less deformations in this box too. 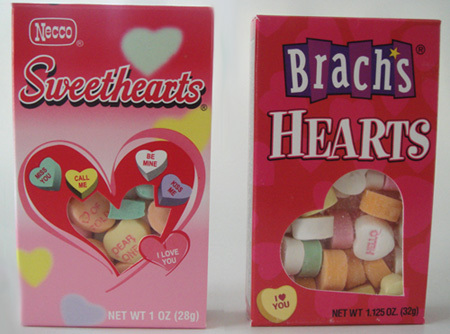 Unlike NECCO, all of the colors taste the same, which is a bland and faintly licorice flavor. The thickness of these hearts make them even harder to break and the experience is a disappointment. I guess it depends what you want to use these for. For presentation purposes, like maybe gluing these to a card, I’d go with Brach’s for their better formation and more consistanly readable text. 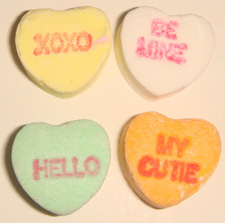 For flavor, say in a dimly lit room and your valentine for to wear thier contacts, you’d want at least the flavors found in the NECCO hearts. Of course I didn’t realise Mars owns Milky Way until after I bought these but when I’m in the store and I see something worthy of comparison I just buy it and look it up when I get home. Besides, there’s a reason a company produces similar products, and since this blog is about figuring out which one may be the better purchase, we went ahead with the evaluation. 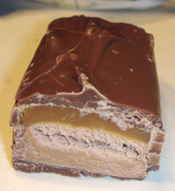 For those who may not know, Milky Way and Mars are fluffy nougat topped with caramel and then coated in chocolate. Mars is basically the European version of Milky Way and can easily be found in the British food section of any Stop & Shop here in New England, and I would bet it’s worth a shot looking for it in any major super market around the country. I noted that this smelled very cocoa-ey, which is always nice that chocolate smells like chocolate. This was more dense than I remember it being and I’m not sure if I liked that so much. Ethan thought the flavor was good and didn’t mind the density and said after it warms up in your mouth for a little bit it’s ok. We both thought the chocolate coating was a bit hard but the nougat-caramel-chocolate ratio was proportioned correctly. I liked this because it had a cleaner cut, which I know doesn’t matter for taste but it appealed to me somehow. I also liked that this was a softer bar. 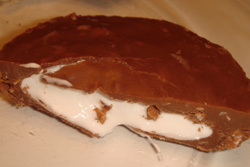 The chocolate, caramel and nougat yielded to the bite very nicely and didn’t have that heaviness that Milky Way has. 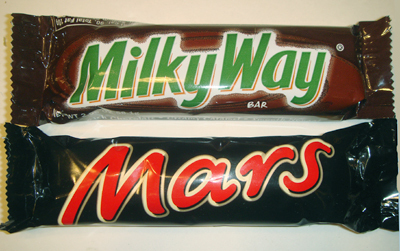 I would take Mars over Milky Way anytime because of it’s softness and light texture. Ethan didn’t mind the density of Milky Way and wasn’t a fan of the nutty flavor he detected in Mars. I didn’t taste anything like that in Mars that but I guess we just have different palettes. SO even though these are both under the same company, they are different enough that one could easily be preferred over the other.